Spiritland opens Headphone Bar showcasing "world's finest portable audio" | What Hi-Fi? The Mayfair shop – Spiritland’s second dedicated hi-fi space in London – has high-end headphones, portable music players and amplifiers for people to demo and buy. Three years ago, Spiritland opened as a "unique new music space" in central London (it now resides in King's Cross). A cafe and bar, it was billed as an audiophile venue, as it was built around a bespoke "world-class sound system", made for the venue by Living Voice. The venue hosts events with DJs and musicians, where the focus is as much on enjoying quality sound as it is quality tunes (and food and drink). Today, Spiritland has announced the opening of a second venue in London, which will focus on headphones - some of the world’s finest personal audio equipment, in fact. 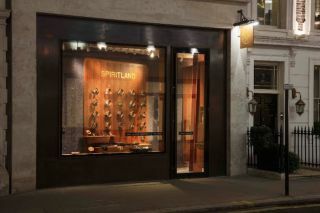 Visitors to the Spiritland Headphone Bar on New Burlington Street, Mayfair, will be able to demo and buy from some twenty pairs of headphones, as well as a range of portable music players and amplifiers. There's a focus on the high-end, with prices from £150 to £4,000. Inside you'll find gear from some familiar brands, including Astell & Kern, Audeze, Chord, Sennheiser and more. And if our eyes aren’t deceiving us, we can spot some Meze 99 Classics in the picture above. So the next time you're in central London and fancy some downtime with some high-end portable audio, this sounds like a decent place to check out. The only downside to Spiritland's second venue? No beer or cake. What Hi-Fi? Awards 2017 - all the winners revealed!